It can be difficult to find the time to wash your car, but it’s crucial that you get your tires washed at least once a week. However, if you are not that bothered by the car’s appearance, you can always reduce this time. 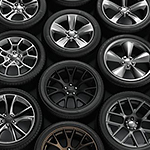 Your tires just need more attention than other parts, because you don’t want them to grow dry and cracked due to dust collecting in the tread. If you find that your tires are constantly looking brown, then you should just do a sweep of your garden hose to dislodge some of the debris and dust. You can wipe over the tires with a microfiber cloth. This will remove a lot of the grime from your wheels as well. As you wipe over your tires, remember to rinse off an residue of the cleaner so that you’re not damaging your tires. Want to get a better clean? Try the service team at Maserati of Wilmington Pike for more information.